Homeless people may face a £1,000 fine if they are found sleeping in tents under new plans to ban rough sleepers. The three-year ban, which also includes aggressive begging and drinking, is planned for Hanley, Stoke-on-Trent. 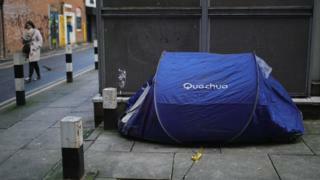 Official council estimates say up to 17 people sleep rough on the streets of Stoke each night. Ian Brayshaw, from the Hanley One Residents Association, broadly agreed with the proposal but added: "In one sense it's no solution at all." The plans put forward by Stoke-on-Trent City Council detail that anyone found to be "assembling, erecting, occupying or using a tent" in an unauthorised area could be fined up to £1,000. The ban would be in place in the centre of Hanley, Hanley Park and two retail parks in Etruria. Insp Sean Clark said Staffordshire Police "fully support" the proposals. "Along with a range of other powers, it will allow us to tackle anti-social behaviour that impacts on visitors to the area and those people who live and work within the city centre," he said. The chair of the Stoke-on-Trent homeless forum says she is not against the idea, but questioned where the homeless people would go. Wendy Hocking added the proposed ban was about making the area "a better place for other residents". Mr Brayshaw said many of those people living on the streets had limited options. "It's treating a symptom and actually the problem is to do with services for the homeless, drug and alcohol services, people who've got themselves into very difficult situations."